Kiln Formed Cast Glass Types. Clear glass is most commonly used in today’s building industry. When viewed from a straight-on position, there is a light, natural green tone in the glass. The tone creates a subtle richness in the glass. When clear glass is laid flat on another surface and viewed from the edge, the natural green tone becomes more evident. The natural green tone is created by the iron content in the glass, and the thicker the glass, the greener it appears. When we kiln form our textures in clear glass, the green tone becomes slightly darker. 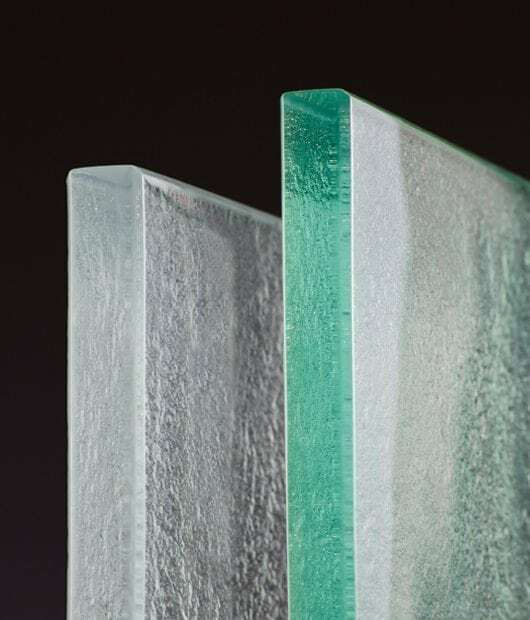 Nathan Allan uses clear glass when our clients want a deeper, richer tone in our architectural glass products. Low Iron glass is exactly what it states; low amounts of iron in the glass content. With up to 90% of iron content removed, Low Iron glass loses its natural green tone and becomes more optically clear. Some will refer to Low Iron glass as “White Glass or Crystal Clear” glass. Depending on the manufacturer producing this glass, low iron glass may have a light Icy Blue or Icy Grey tone. This Icy tone can change slightly from one production run to the next. Nathan Allan will use low iron glass when our clients want a truly Crystal Clear textured glass with no obvious tone. Low Iron glass often works better with lighter or whiter colored design elements. Nathan Allan will typically use low iron glass when we apply any of our vibrant color finishes onto the textured glass surface. Low Iron glass allows the color finish to read more accurately. (Clear glass can slightly change the color finish appearance).